I hate a lot of stuff, or at least it can appear that way to the reader passing through. My cousin suggested over dinner a few weeks back that I change the blog’s name to Hate Less and Less. The suggestion didn’t quite make sense; he’s not too bright. But the spirit of the comment resonated with me. Some vitriol comes through in these here pages from time to time. I never thought of it as hate so much as annoyance. Things irk me. Hard as it is to believe, I’m not perfect… far from it. But I’m basically a nice guy with a positive outlook. I don’t walk the sidewalks scowling at old ladies and kicking small children. Nor do I lambaste random strangers and give them wedgies as they pass by. I could; the world is filled with easy targets and people wearing underwear. But I don’t. A protracted job search would wear on most people. The daily grind of looking for something so elusive can be overwhelming. Just ask one of the millions who’ve seen their unemployment outlast their unemployment insurance. I’ve managed to supplement government help with freelance and temp work, when I can get it. That’s kept me going. All things considered, I’ve fared pretty well. But maintaining a good attitude is a struggle. Life is hard for everyone sometimes. But I don’t hate anybody for my problems. What good would it do anyway? It’s not their fault. Besides, there’s already plenty of real hate to overshadow whatever inspires me to hold forth with precise and fluid prose in the hallowed pages of this irreverent and insightful blog. A quick scroll through the TV news channels reveals as much. It’s all talk of mosques and immigration… how foreigners are coming to take our freedoms and our jobs and make us worship Allah and speak Mexican. Election season promises to dial up the hate even more; what better way to show leadership potential than to trash the little guy? I can hardly wait. A lot of this hate is aimed at my neighbors. Jackson Heights is one of the most diverse neighborhoods in the country, with 100+ different languages spoken, including English, thanks to Wifey and me. The array of cultures is amazing, with every continent represented, including Antarctica. My downstairs neighbors are penguins. I take credit for adding Wasp to this extensive and varied list. Most Saturdays find me strolling the shopping streets in crisp white boating pants, with a popped collar and an Izod sweater tied loosely around my neck, tossing dollar bills over my shoulder as I spew random stock market and nautical terms, such as Dow Jones, capital gains, starboard and, uh, sailboat. I’m proud of my heritage. Not surprisingly, many of my neighbors are undocumented and/or practice Islam. I don’t know most of them personally. But I see them in line at the store and the bank. I sit next to them in restaurants. I stand behind them on the subway platform. I bump into them on the sidewalk. They’re pretty and ugly. They’re nice and mean. They’re rich and poor. They’re hardworking and lazy. They’re generous and stingy. Every adjective – positive and negative – applies on some level, as it does to every group of people. The people we hate are the same as us. They are us. So why do we Americans hate ourselves? Where does this self-loathing come from? I wish I knew, so I could give the nation a giant lollipop to allay our national crying fit. There are so many real issues to address, such as the stagnant economy that keeps so many of us un- and under-employed. Instead we go on hating the new guy because he’s different, as we have since the birth of the nation. He threatens to upset the status quo, and slightly change our glorious way of life. And that scares us. We hate because we’re afraid. I’m scared too. But rather than hate, let me put forth something that I like. I like my neighborhood – Jackson Heights. I like that it’s a true melting pot, in a country that embraces the term yet so rarely achieves the true meaning. I like that it offers an opportunity to people not afforded one before. 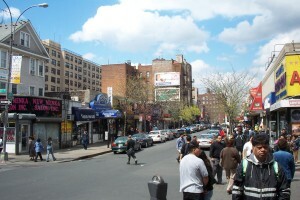 I like that Jackson Heights is Ground Zero for the American Dream. People from all over the world come here for a chance, and they get it. To hate that is to hate America. This was written by Norm. Posted on Saturday, October 9, 2010, at 6:30 am. Filed under Feeling Sorry for Yourself, Jackson Heights, Job Search, Recession, Unemployment. Tagged America, American Dream, Ground Zero, immigration, Islam, Jackson Heights, job search, jobless and less, mosque, Temping. Bookmark the permalink. Follow comments here with the RSS feed. Both comments and trackbacks are currently closed. Careful now, an agent of the Retardicans might consider you a closet liberal. It’s un American to like anything that doesn’t help big business prosper. In all seriousness I happen to think diversity is a good thing, it helps you grow as a human, and I think that is the master plan for us all along. Hateless or jobless, it’s good to see you posting again, Norm! I think the Republicans brand you liberal simply for accepting unemployment benefits. I think that would make Norm a Marxist,….er Communist….Socialist…dang it, I get the “ist” confused these days, I blame Fox News for the confusion. Hmmm…. You have a point. But from the FOX News perspective all of those are simply synonyms for “Liberal”. Unemployment is one of the biggest problem in America. Everyone has been desperately finding their job.